The Diamonds ETF is above this week’s pivot at $261.35 with its all-time intraday high at $269.28 set on Oct. 3. The Spiders ETF is above this week’s pivot at $288.38 with its all-time intraday high at $293.94 set on Sept. 21. The QQQ ETF is just below this week’s pivot at $186.02 with its all-time intraday high at $187.53 set on Oct. 1. 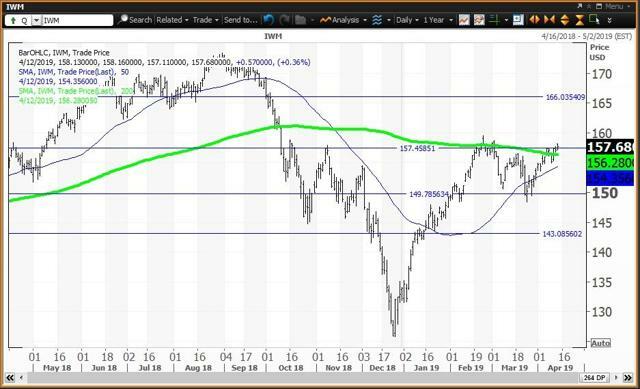 The transports ETF tested its annual risky level at $196.35 last week with its all-time intraday high at $209.43 set on Sept. 14. 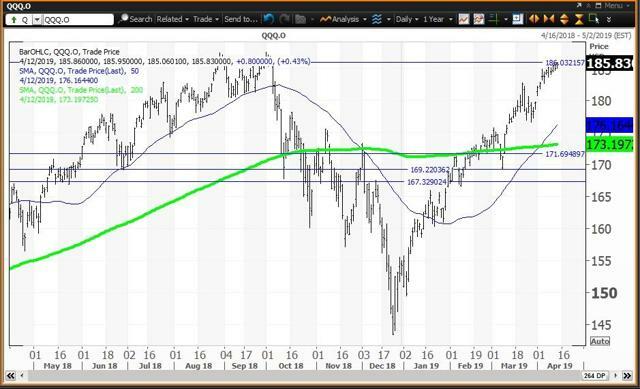 The Russell 2000 ETF has been trading around its annual pivot at $157.49 since Feb. 20 with its quarterly risky level at $166.04. Today, I show the daily charts with their key technical levels. Please ignore any media outlets that tout new all-time closing highs! This is totally misleading and an outdated analysis since the early 1980s. A warning is starting to show on weekly charts for Spiders and QQQ as their 12x3x3 weekly slow stochastic readings are above 90.00 which I describe as an “inflating parabolic bubble.” Diamonds and transports are overbought with readings above 80.00. The Russell 2000 has a reading that has fallen just below 80.00. The Diamonds ETF is in bull market territory 21.7% above its 2018 low of $216.97 set on Dec. 26 and is 1.9% below its all-time intraday high of $269.28 set on Oct. 3. Remember that the Dec. 26 low was a “key reversal” day as the close was above the Dec. 24 high. 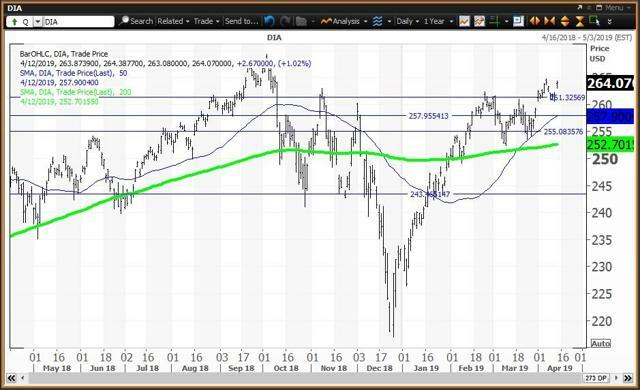 My annual, monthly and semiannual value levels are $257.94, $255.08 and $243.47, respectively, with a weekly pivot at $261.35 and quarterly risky level at $279.04, which would be a new high. The Spiders ETF is in bull market territory 24.2% above its Dec. 26 low of $233.76 and is 1.3% below its all-time intraday high of $293.94 on Sept. 21. Remember that Dec. 26 was a “key reversal” day as the close was above the Dec. 24 high. 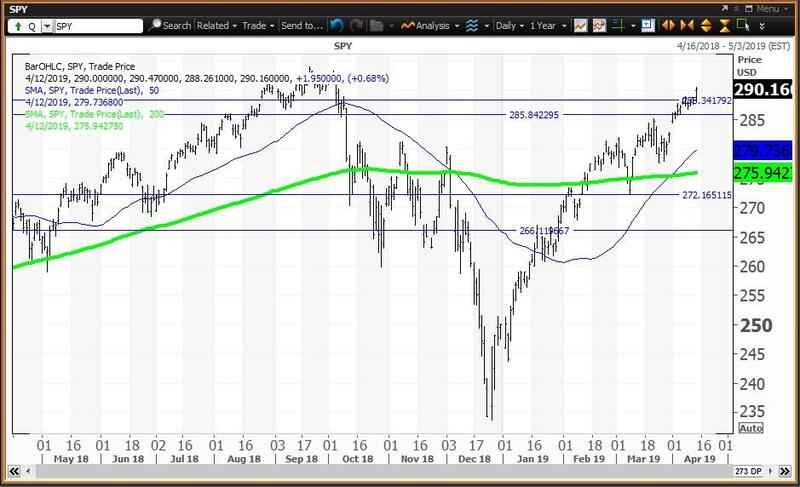 My annual, monthly and semiannual value levels are $285.86, $272.17 and $266.14, respectively, with a weekly pivot at $288.38 and quarterly risky level at $297.56, which would be a new high. 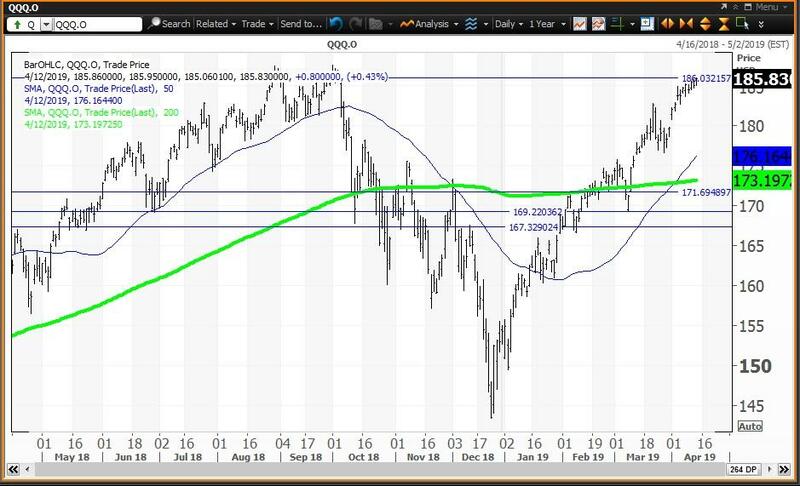 The QQQ ETF is in bull market territory 29.5% above its 2018 low of $143.46 on Dec. 24. QQQ is just 0.9% below its all-time intraday high of $187.53 set on Oct. 1. My monthly, annual and semiannual value levels are $171.67, $169.27 and $167.53, respectively, with a weekly pivot at $186.02 and quarterly risky level at $194.29, which would be a new high. IYT is 26.5% above its 2018 low of $155.24 set on Dec. 24. The ETF is 6.2% below its all-time intraday high of $209.43 set on Sept. 14. My monthly and semiannual value levels are $177.59 and $159.63, with annual and quarterly risky levels at $196.35 and $204.78, respectively. 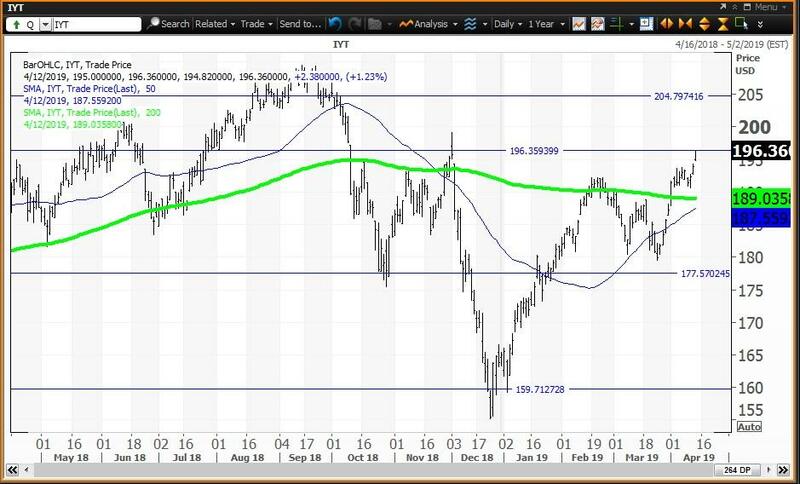 IWM is 25.3% above its 2018 low of $125.81 set on Dec. 26 and is 9.1% below its all-time intraday high of $173.39 set on Aug. 31. My semiannual and monthly value levels are $149.77 and $143.05, with my annual pivot at $157.49 and my quarterly risky level at $166.03.